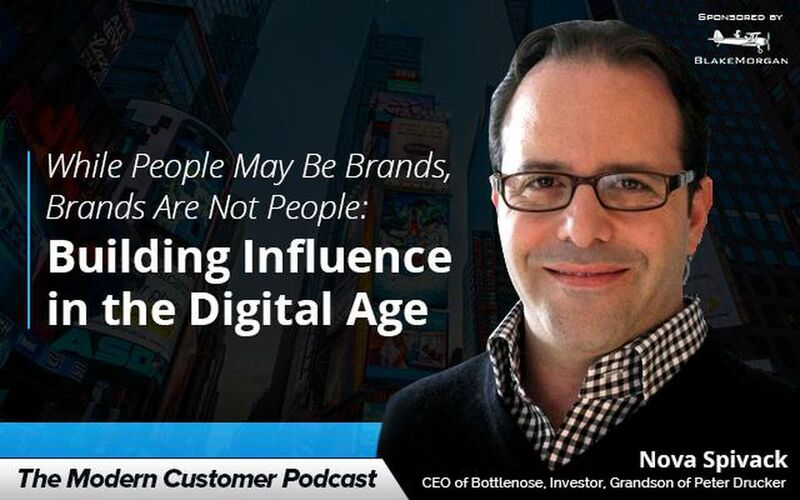 Peter Drucker’s grandson Nova Spivack, CEO of Bottlenose, says that Drucker would have felt today that real influencers are not spending a lot of time on social media. In The Modern Customer Podcast this week we talk to Spivack who is an entrepreneur and investor who at six years old remembers being in line behind Jack Welch for an appointment to spend time with his grandfather, one of the most famous management thinkers of our time Peter Drucker. These memories are vivid for Spivack who today spends time thinking about the big business questions we face today. Spivack believes his grandfather felt real influence is not visible but built through face to face interaction. From personal branding and influence to building a brand’s influence, we cover it all in this podcast. There are many challenges Spivack sees for brands that are trying to build influence. He says while people may be brands, brands are not people. While you can “friend” a brand, this is not a bi-directional relationship. Brands have to recognize that they aren’t people and the relationships they’re building are not like human friendships. Brands need to become memes–virally replicating ideas that spread through cultures. Spivack says brands are more like viruses than they are like people. Spivack’s grandfather coined the term the “non-customer.” Spivack argues that you still need to understand these non-customers as much as you seek to understand your customer. It’s your non-customers that represent your potential for growth. Brands today spend an immense amount of time but not enough time trying to reach their non-customers. Recently through there have been some debates around the focus on non-customers from a branding perspective versus purely focusing on the valuable top spending customers. According to Spivack one of the things brands need to do is think of the risk of having only one niche. If we look at evolution the species that have survived—if you can compare this to brands—are the species that were not confined to one ecological niche. They were able to colonize other niches. You can think of demographics and audience segments as niches.